Last week went by in a blur. The degree of tiredness I felt Mon., Tues. and Wed. was something I can't describe and don't remember ever experiencing before, and they were being easy on me! Tues. was probably the worst - I was exhausted from Mon. and had to do it all again. I was literally holding onto the wall in a stall at one point and trying not to throw up. How tired was I? I remember trying to say something to one of the other women working in the barn and the effort it took to make my lips move took all my concentration. And I slurred! Who knew tiredness could affect speaking? I don't want to make it sound like they were working me hard. I didn't have to do it, and I only did about half of what the regulars did. I wanted to experience and do as much as I could though. I have a much better idea about reasonable expectations for future employees and a HUGE respect and appreciation for barn workers. In my defense I'm mid fifties and have been working at a desk for decades. They're early twenties and in amazing shape. Miraculously by Thur. I found my stride. Early afternoon it dawned on me that I wasn't going to hit the wall that day and I was actually enjoying myself. at the manure pile, dump off the end of the board which directs where to dump. Spread out what you dumped. This helps keep adding in layers. The other workers also groom and prep training horses for Sue to ride and sometimes warm them up for her. I did a little grooming. Mon. was his first time under saddle since his surgery over a month previous. He was a good boy and did some good work. He got better every day, and by Thur. we had one of our best rides ever. Sue says we'll hit first level this year. I hope so. I know we're late, but we were without lessons for a long time and good basics are soooo important. We've made good progress since being here, even with all the time we've missed. I'll try to get some pictures or video soon. Here's a picture of one of my fellow barn workers, Bianca, sharing kisses with Rogo (he loves it!). It was around -20 this morning and didn't get above -10 today (if that) . I was in the barn all day except for a short lunch break and I stayed warm. I'll write what I've learned about dressing in a future post. I'm behind in my blog reading and commenting. I'm too tired at night! :) I'll look forward to catching up with coffee when my working student gig is over. Join the club! After doing this for the past 30 years I get the picture. You are going to have a very good sense of what it takes when you complete this "internship." Happy to read that you and Rogo have gotten in some good riding. The temperature does not sound quite as exciting. Thanks for tuning us in. I give you lots of credit for doing this and it is going to make a difference in your future business. I give you tons of credit for doing this. I took care of a five-horse barn when my instructor went on vacation. I cannot imagine a barn of thirty! That is crazy, hard work. 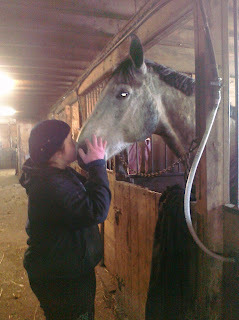 Brett helped out at a dressage barn a few years ago -- he lasted one day -- and he's a strong guy. It's really REALLY hard work. Heck, its work just taking care of the four + donkeys here. I give you a lot of credit for sticking it out. I've done a well organized eight horse barn - well organized being the key. And an up to twenty horse trail barn - terribly disorganized and filthy... felt so bad for the horses. I learned about what not to do there. Really glad Rogo is back in work again. Can't wait to hear about your rides! "....if I read your post correctly, I noted that you said you were a 50-something woman and as such, I must commend you on your incredible amount of emotional strength and motivation, along with physical strength too, (even if you did get tired the first few days!). I am truly amazed by what you're doing and you are a role model for all older worker/riders (I'm in the "50-something club" too and if I were in your shoes, I would be carted away by ambulance after only a few hours of doing the work you've described!)." Congrats. I am very organized with one horse in getting grain and water ready the night before to a stress free morning. Idk why you use straw for bedding but I am a huge fan of EquineFresh. It is amazing. You don't have to strip the stalls as often and it is easy to clean. Plus down the road it is cheaper (I think). Just a thought tho if you would like to look into it. I'm exhausted just thinking about this! I admire your dedication. If I could have half the drive I'd be thrilled beyond words lol. Yep, sounds exactly like our barn, minus the fancy feedings:) each horse does have individual feeding amounts, feeds, hay, etc. but we have 42 horses. One day a week I am all by myself and by the end of the day I can barely walk! That's the night hubby cooks dinner and all I'm required to do is take a shower. I use to have dreams of owning my own place but after working for two and a half years at the place I board at, you couldn't give me a boarding barn for free! Good for you! I worked in a show barn with 22 horses and I was always bushed at the end of the night and I was 28 years old!!!! Knowing that you were doing all this gave me such inspiration this week. I really got to work at my own barn and did all kinds of barn chores that I usually leave for my barn helper. She probably thought I was nuts! I can't wait to read about your warm weather clothes advice. My boots are shot and I am waited for your words of wisdom! You will be so fit at the end of this! Rogo is adorable in his photo! I know from listening to my 18 yr old daughter what your days are like! 20+ dressage training barn - no boarders, per say, all are in full training. So she begins her morning (at 6 am) with the feeding, cleaning, turn out routine - and starts riding with her trainer around 11 am. Her days end around 7 pm. It wears me out just listening to her! But what an experience - hang in there! Carol you are an inspiration!! I geniunely admire and respect how you are learning the 'business'. Not everyone would. As for Rogo! GLORY DAYS! He's healed up and under saddle again! Carol, what a hard first few days those were! Good for you for sticking with it! And I'm so glad Rogo is better and you have had some time with him! The farm where I board has thirty horses, and on the weekends I help feed several of the barns. Occasionally when the barn owner is gone, I feed all of them! It is a big job, and all of the details of order, feed, supplements and knowing the horses are important. Good work!! You really had lots of work to get done. I know how hard that can be. I'm happy we only have seven horses to take care of now and not a barn full. Togo looks ver happy to be getting his kisses, as he deserves. Glad to hear you had some nice rides and it's good that your boy is fEeling better. Hang in there it's a good learning experience all around. Especially, how it feels to be an employee in a barn. Did you say one cup of green tea? Can you tell me about that supplement? Thanks for all of the comments and feedback. Appreciated! Juliette my boots are Bogs and I love them. They are amazingly warm. Prairie Nerd all I know is that we give two cups to horses and one to ponies and I'm told it is good for their immune system.